I am always looking for something easy to make the kids for lunch on the weekends, but lately I have been slipping into the habit of serving up veggie dogs and fries. The kids love it, of course, but Vegan Mom and I can only take so many veggie dogs. Today I made something equally fun (they get to use their chopsticks) and equally easy. 1. Cook noodles according to directions on package. 2. While noodles are cooking, heat a wok over med-hi heat. Add oil, then stir fry chestnuts and chickpeas for 1 min. Add remaining ingredients (except onions) and bring to bubbling. Adjust sauce to taste. 3. 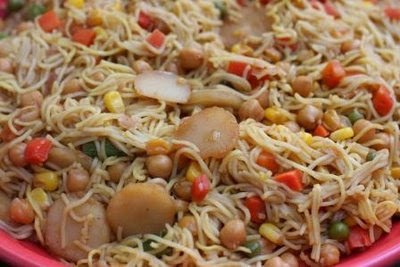 When noodles are cooked, drain and add to wok. Mix well, adding more sauces if needed. Garnish with green onions, if using.